In the following years, the tensions mounted – as in 1840 and 1860. Very little was needed to ignite the fire. 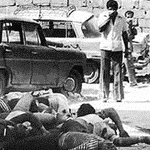 On 13 April 1975, there were two serious incidents between Palestinians and (Maronite) Phalange, in an eastern suburb of Beirut, traditionally a Christian area. The Palestinians attacked a church, and in return the Phalange, led by Pierre Gemayel, attacked a Palestinian bus, with 27 deaths as a result. This was the starting shot for fights, first between the Phalange and Druze leader Kamal Jumblatt’s Lebanese National Movement, which grouped various, mainly Muslim, leftist groups, all allied to the PLO, around his Progressive Socialist Party (PSP). Shortly after the Civil War had broken out, almost every religious community had created its own militia. The Civil War was not a war between Muslims and Christians, at least not at all times, although it seemed to start along religious lines. Instead, it was a war between left and right – ‘the Left’ being strongly in favour of a redistribution of power according to existing realities, ‘the Right’ opposing such a redistribution. 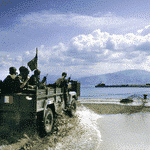 Alliances between Lebanese groups sometimes shifted, as did support from abroad. To illustrate this: the (Maronite) Phalange and its militia, the Lebanese Forces were first allied to Israel against Syria, which initially supported ‘the Left’, but later sought the support of Syria when a victory of ‘the Left’ seemed imminent. Druze leader Jumblatt changed sides as well, as did the Maronite Michel Aoun, former commander of the Lebanese Army. Foreign states supported and armed one faction, then another. Syria was initially on the Palestinian side, then against them. The longer the war went on, the greater the number of militias. Sometimes one neighbourhood fought another. The Civil War became a vicious circle, violence always leading to more violence. 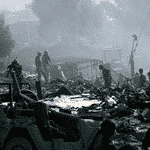 Militias started to pay their gunmen and other ’employees’, who mostly had lost every other means of survival. Many countries intervened, either openly (Israel, Syria) or covertly (Iran, Iraq, Jordan, Egypt, Libya), or sometimes on both levels (United States, France). Syria sent troops in agreement with the United States and the League of Arab States, in an effort to control events. However, the Syrian troops stayed when the others left. 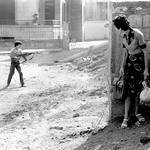 In 1978 and 1982, Israeli forces invaded the country. 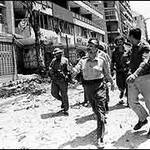 In 1982, Israel army commanders looked on while the militia of the (Maronite) Phalange committed the well-documented massacres of the Palestinian camps of Sabra and Shatila, after ‘their’ President-elect, Bashir Gemayel, had been assassinated. Whole villages were massacred – sometimes for no other reason than that a politician considered an ‘enemy’ had been born there, or that his family lived there. Palestinians and Druze massacred the inhabitants of Christian villages, Christian militia attacked Palestinian camps (like Tall al-Zatar in September 1976) and massacred the inhabitants of Druze or Shiite towns. 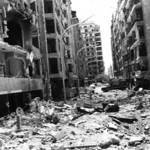 Palestinian camps were also attacked by the Syrian troops and, later in the war, by Amal (during the so-called War of the Camps). Although the economy remained stable for several years, largely due to the presence of oil money, it eventually collapsed – especially after the destruction of the banks. The Lebanese pound plummeted, prices soared. For many people, the only way to earn money was to enrol in a militia. Militias financed their actions through drugs trafficking and other criminal activities, often in tacit cooperation with one another, as a ‘convenient stalemate’. Thus, the war continued. Hundreds of people – among whom a few dozens of foreigners – were kidnapped for ransom or other ends, and were sometimes held captive for months or even years on end, often eventually to be killed. The total number of those killed in the Civil War amounted to over a 100,000. Time and time again, Middle Eastern as well as Western powers not only armed the belligerents (or fought them), but also tried to involve them in negotiations. Conferences were held in Beiteddine (1978), and in Geneva and Lausanne (November 1983-March 1984). There was even an agreement signed in Damascus (1985) between Christians, Druze and Shiites. Finally, the Taif Agreement (1989) led to the end of the Civil War. However, the fighting continued for another year.